Two famous Formula 1 cars with unique Australian connections will be coming ‘home’ from the UK for the 2016 Phillip Island Classic Festival of Motorsport from March 11-13 – thanks to their current enthusiastic UK owners, Andrew and Margaret Wareing. From the 1960s comes the works 1.5 litre BRM P261-5 that was raced by Graham Hill, Ritchie Ginther and Jackie Stewart in Formula 1 from 1964. Later, factory-fitted with a larger 2.0-litre V8 engine, the same car contested the 1965, 1966 and 1967 Tasman Championship in Australia and New Zealand with Stewart and Richard Attwood. Driven by Graham Hill, the car’s best F1 result was second in the 1964 French Grand Prix, while in 1966 it scored five race victories in the 1966 Tasman Series, with Stewart taking four of its race wins to clinch the eight-race Australian-New Zealand Championship. Following its F1 era, P261-5 was fitted with a 3.0-litre BRM V12 engine and driven in non-Championship races in 1968/69 by David Hobbs, Tony Dean and Charles Lucas. After spending some years in a Museum in the UK, the BRM was returned to its original 1.5 litre GP spec to meet Historic Grand Prix Cars Association regulations before it was acquired 10 years ago by the Wareings, who have since raced it in HGPCA events, Historic Monaco and the Goodwood Revival. 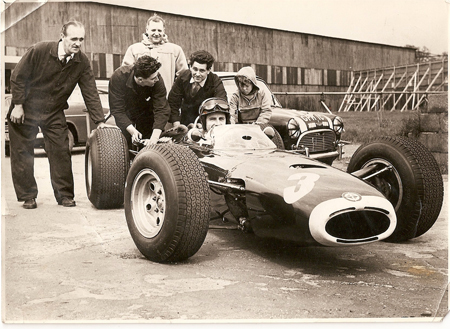 The BRM has also been driven in recent years by Sir Jackie Stewart in demonstrations. The Wareings are also bringing their famous Williams FW06 to Phillip Island – the first car produced by the combination of Frank Williams and Patrick Head for their Williams Grand Prix Engineering Formula One team. Powered by a Cosworth DFV 3.0 litre V8 engine and driven by Australia’s Alan Jones, the FW06 competed as a lone Williams works entry in all 16 rounds of the 1978 FIA World Championship. It finished in the points three times, with Jones’ best result being second place in the US GP at Watkins Glen. Chassis FW06/03 also saw service in the first four races of the 1979 season, with Jones finishing third place at Long Beach. However by now the car was being left behind by the ground effects cars of Lotus, Ligier, Tyrrell and others and it was replaced by the FW07 that Jones ultimately used to win the 1980 World Championship. Following its F1 career, Williams sold FW06/03 in mid-1979 to a wealthy Italian industrialist, who used it for private track days before it was purchased by its current owners in 1992. Since then the famous Williams has been driven by Alan Jones at the Goodwood Festival of Speed and the Wareings have lent it back to Williams GP for other displays and demonstrations. Andrew Wareing (with Margaret’s permission!) will drive both the former F1 cars at this year’s Phillip Island Classic FOM. At the meeting, the BRM P261-5 will compete in Group M & O events for open wheelers from 1961-1970, where one of its main rivals will be another great F1 car of the 1960s – the 1968 2.5-litre Repco Brabham V8 of Victorian Peter Strauss. Meanwhile, Andrew Wareing will also race the FW06/03 at Phillip Island in the Q & R events for racing cars built from 1970-1985. Here, its principal F1 rivals will be the 1971 March 741 to be raced by four times Australian Champion, John Bowe and the 1985 ex-works Lola 1.5 Turbo of Sydney’s Iain Ross. The open wheeler programme at this year’s ‘Classic’ will also see a near- record number of Formula 5000 racing cars compete over the event’s three-day programme, with 13 cars coming from New Zealand to take on 17 of Australia’s top 5.0 litre V8 open wheelers in the hands of their local drivers. For further information visit www.vhrr.com or call (03) 9877 2317.